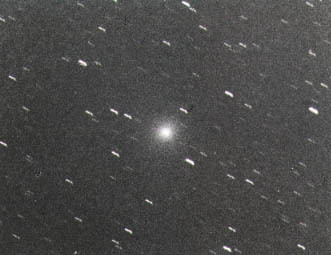 A 7th-magnitude comet was discovered simultaneously by a number of people, which suddenly appeared slightly west of the Great Andromeda Galaxy around 4 am, May 1, 1968. The coma was more than 5' across, and although the tail was not visible, it was bright in a small-aperture comet seeker. Mr. Koichi Itagaki in Yamagata City discovered this comet first in Japan on April 25 but could not report it immediately. Mr. Katsushi Ito in Hachinohe City also discovered it independently. I also searched the regions near M31 the same morning without success. This photograph was taken on May 2 by a 15cm reflector with a 10-minute exposure. It's about time for a new bright comet to appear in the eastern sky.